Celebrate good times, c'mon! Click here to play! It's a massive party and you're invited. Make an appearance for plenty of fun and a chance at big money wins! 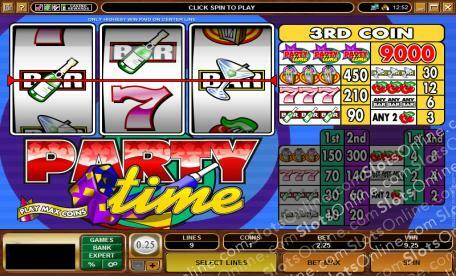 The Party Time logo is your ticket into this exclusive party so spin it across the reels as many times as possible. Three of them across the single pay line will get you up to 9000 coins! You can't have a party without some groovy tunes. Spin three jukeboxes across the pay line to gather 450 coins. Lucky sevens are also hanging around. Three of these numbers across the pay line will get up to 210 coins. The champagne and drinks are certainly flowing freely in this fantastic game. Spin three champagne bottle BARS to get up to 90 coins, and three martini BARS to get 30 coins. There are also cherries and BAR combinations to help you have a great time at this party. Be sure to play max coins (three coins) to activate the highest pay table. That way you'll be bringing in all of the biggest wins! Get down at this exclusive party for a great time and a chance to spin in plenty of big money wins!